A fine French violin bow by Auguste Barbé. 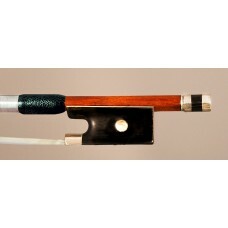 A beautiful and rare French master violin bow by Auguste Barbé, certified by J.F. Raffin in Paris. 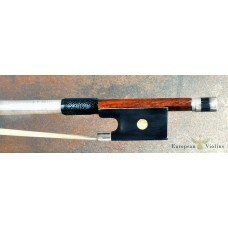 Auguste Barbé was a highly respected bow maker - who worked exclusively for Gand & Bernardel. His beautiful bows are estimated & equal to those of F.N Voirin. His work is highly praised, and admired by many professionals and collectors.. Very nice ebony frog with pearl eyes and a fine three part screw; a,d a very well executed,and elegant head. 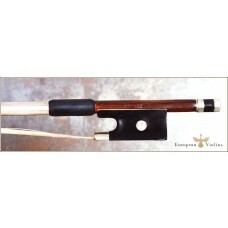 The total length of the stick is around 72.7 cm and the weight of the bow is around 58 gr. The bow is straight and has a good curve, no cracks. Auguste Barbé (1853-1902) was a French Archetier (bowmaker). Mathias Théophile Auguste Barbé son of Dominique Barbé and first cousin of Télesphore Barbé, completed his apprenticeship in Mirecourt, presumably under C.N. BAZIN as did many of his contemporaries. Around 1880 Barbé began to work for GAND & BERNARDEL frères before joining their Parisian workshop in 1886, the year during which the firm became GAND & BERNARDEL. Auguste BARBÉ spent 10 years with this important and influential firm, developing a style which came close to that of François Nicolas Voirin. In around 1896/1897 Barbé returned to Mirecourt where he opened his own workshop at 1 rue Chanot. "His work is highly praised, and admired by professionals and collectors alike. His best work has been mistaken for François Nicolas Voirin, it is that good."